If you know me, this is a big deal. 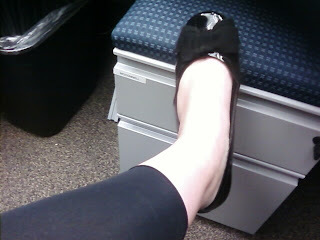 Today, I have on... flats. Flats. You might even laugh when you read this post. If you don't know me, you'll probably roll your eyes and possibly stop reading the blog. The Best part? I found some that fit! I love flats! And I just about this - did you actually wear heels the whole time you were pregnant? I was exclusively in flats pretty much second trimester on! I wore nothing but flip flops from the second trimester on becuase my feet were an ungodly size... I wore heels until like 18 weeks... I still wear them :) just not every day now!